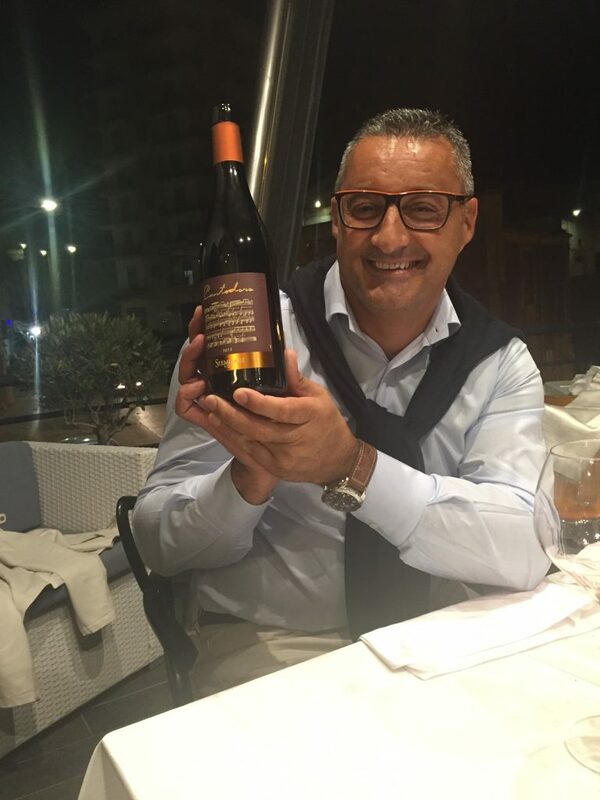 “Tell me what you know about pinot grigio,” says Lucio Matricardi. The chief winemaker of the winery known as Stemmari in the US and Feudo Arancio in its native Sicily is asking this of a small group of journalists gathered for a four-course seaside pairing lunch (light compared to the epic dinner the night before in the nearby fishing town of Sciaccia) as he presents Stemmari’s version of pinot grigio, grown and produced just a few miles away from where we are dining. 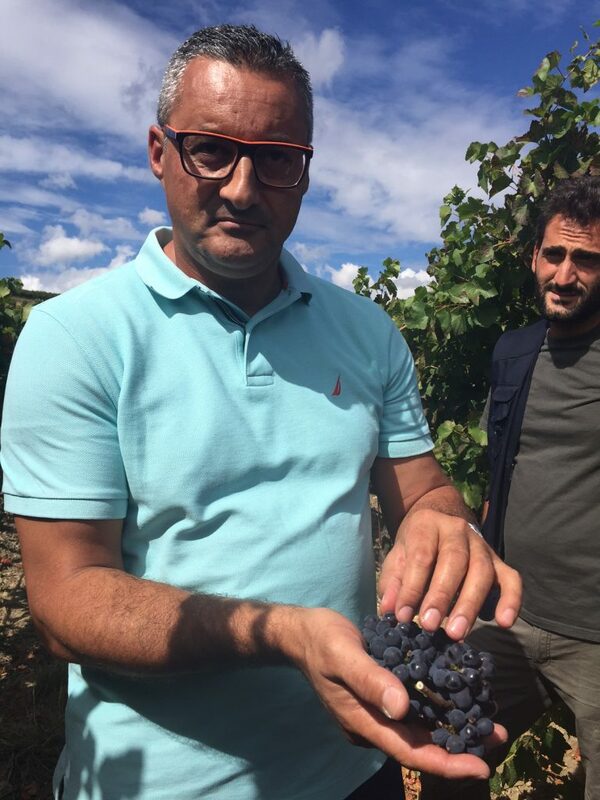 Winemaker Lucio Matricardi displays a bunch of nearly ripened pinot noir grapes with vineyard manager Daniele. Most people associate pinot grigio with mass produced, easy-drinking wines that appeal to certain drinkers because it’s got no sharp edges, almost like drinking water. Commonly made from grapes grown in cool climate soils, they're dry, light, citrusy wines with very few tannic or aromatic properties to consider (though there are some outstanding exceptions, such as those from Elena Walch). It would seem that a Sicilian vineyard making a PG would be jumping a shark in a fermenting tank for purely commercial reasons, but Matricardi set out to achieve this project with a very specific goal - that the wine be utterly Sicilian. The grapes are allowed to fully ripen in the warm sun, allowing bolder character traits that are tamped down in cool climate styles to come through. This is no mere aperitivo, a word Matricardi detests when it comes to the typical marketing strategy for that wine style. Instead, it’s a main event wine. Paired with Sicily’s famous red shrimp - which the locals prefer raw with a drizzle of olive oil and citrus to bring out its inherent balance of sweetness and umami - and a tuna carpaccio, the full bodied, dense fruit and aromatics of the wine immediately sends question marks to my flavor receptors. It doesn’t compare to any others I’ve tasted, and that is precisely the point. 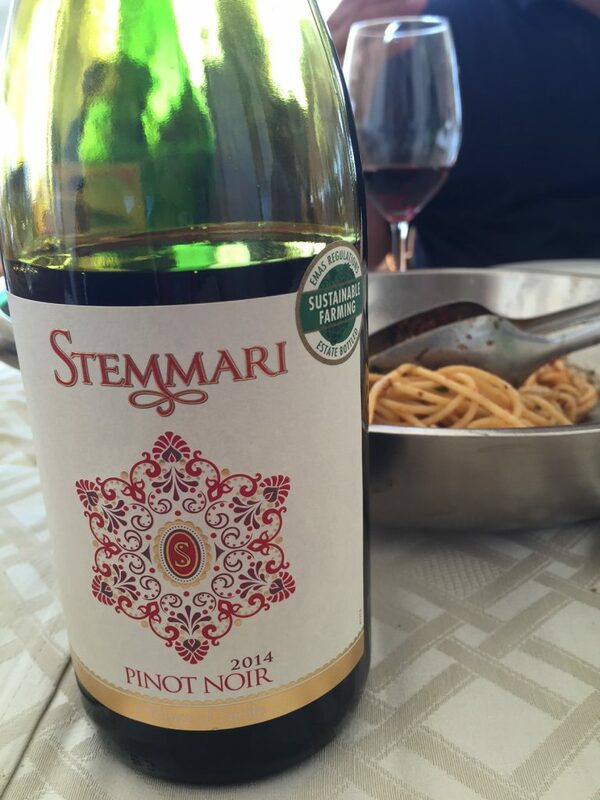 Stemmari Pinot Noir 2014 and pasta with sea urchin sauce - a highly recommended pairing! Stemmari also makes a pinot noir. It’s another offering that some wine snobs would consider to be a strictly profit-making ploy to sell one of the most popular and recognizable grapes in the world. However, Matricardi is quite poetic and philosophical in his approach. Each grape has its own personality. “Pinot noir is the mother-in-law.” What he means is that it can be pushy and difficult to cultivate, but treated with care and respect under the right conditions and it responds with kindness. We have the opportunity to visit the grapes growing in the vineyard less than a week from harvest. Matricardi encourages us to taste them. We bite down and discard the seeds, extracting the luscious inner fruit, while keeping the skin close to the opening of our mouths. Holding them there while chewing, we taste the rich tannins. The skin will macerate with its fruit for only the amount of time it takes to extract some good color without imparting too many bitter notes. The final wine in its youth will be full bodied, with deep berry flavors and silky, dark chocolate tannins unlike other most other pinot noir on the market. The famous red shrimp of Sicily at Da Vittorio restaurant in Menfi. But why should it be? Oregon and Burgundy share similar climate factors, therefore it makes sense Oregonian winemakers would strive for a lighter, drier, earthier Burgundian style. Unlike Stemmari’s wine that is ready to rock once bottled (it sees about 6 months of aging in French oak), they often require additional cellar maturation. Other warmer climate pinots are deliberately big and fruity, such as many of those from California’s Napa Valley, and good luck finding a good one for less than $50. Stemmari’s pinot noir is produced to not only be affordable (only $10!) and fully drinkable in its youth, but to connect with its Sicilian identity. Face it, none of the others are going to taste as good when sipped with spaghetti and sea urchin sauce. Not only does each grape have its own personality, Matricardi explains they also have their own dialects. Moscato grapes hanging from a wire as they dry in the sun for passito. The majority of the wines from Stemmari are meant to consumed young, which is a bold choice in today’s culture of wine investment. However, the idea is accessibility without sacrificing elegance, with grapes that have the opportunity to fully ripen, and attention to details such as cooling the grapes and discarding the bitter seeds before fermentation, controlling the maceration process and keeping a watchful eye on barrique aging. Stemmari rosé paired well with almost everything we ate. Pinot grigio and pinot noir are only a small part of the Stemmari story. 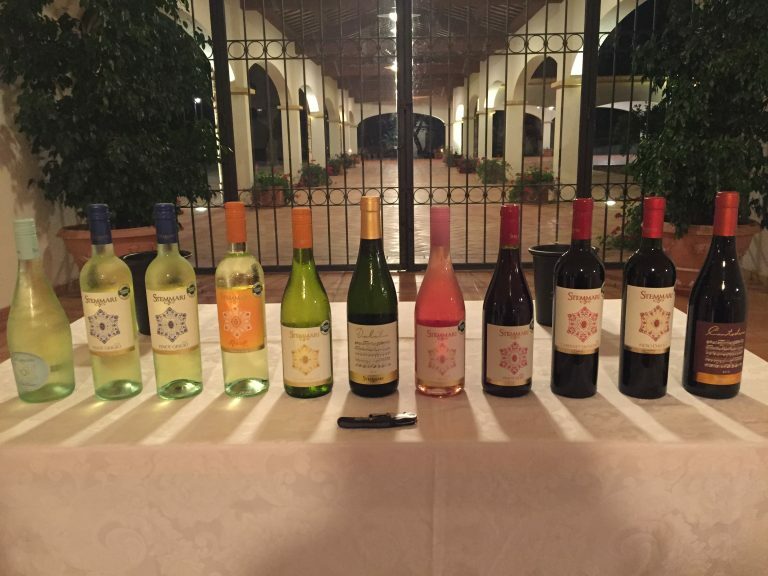 They also produce wines from the two star indigenous grapes of the region - grillo and nero d’avola. We arrive at the nero d’avola vineyard. “Do you think these grapes are optimists or pessimists?” Matricardi asks us. Like all the other varietals grown by Stemmari, they’re organic. On the vine, they seem happy - dark in color and quite zaftig in size. However, we learn that this is a moody grape. They turn all Morrissey-esque and stop producing if they don’t get the nutrients they need from the sun and soil, assuming life isn’t worth living anymore, why bother? This is unlike other grapes which will keep on keeping on when faced with less favorable conditions, like merlot. 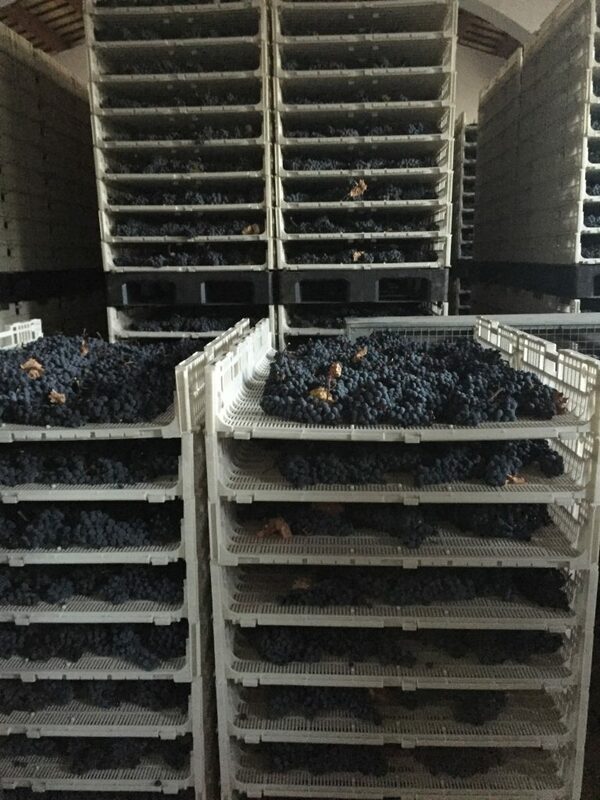 Nero d'avola drying on racks at Feudi Arancio winery. grapes and brings them to the van. In the same manner we tasted the red pinot noir, he instructs us to taste the grillo grapes. The fruit is more intense than the pinot, and though they are a white grape, the skin is also more tannic. The resulting wine is a play between those two properties, with structured, ripe stone fruit and aromatics that don’t get as perfumey as some others I’ve tasted over the years. A few hours after lunch, the group gets a tour of the winery. Matricardi is working on an intriguing experiment - a Sicilian version of Amarone, that will contain raisinated nero d’avola. We are shown the grapes drying on temperature controlled palates. However, in true Lucio Matricardi style, isn’t it better to show as well as to tell? After tasting some unfiltered Chardonnay from the tank, we get a treat - a chance to taste some of the sweet nero d’avola juice directly from its French oak barrique. Then a taste of the wine from its tank before barreling. We see and taste the components of the blend as it’s forming (the resulting wine will be released in 2017). 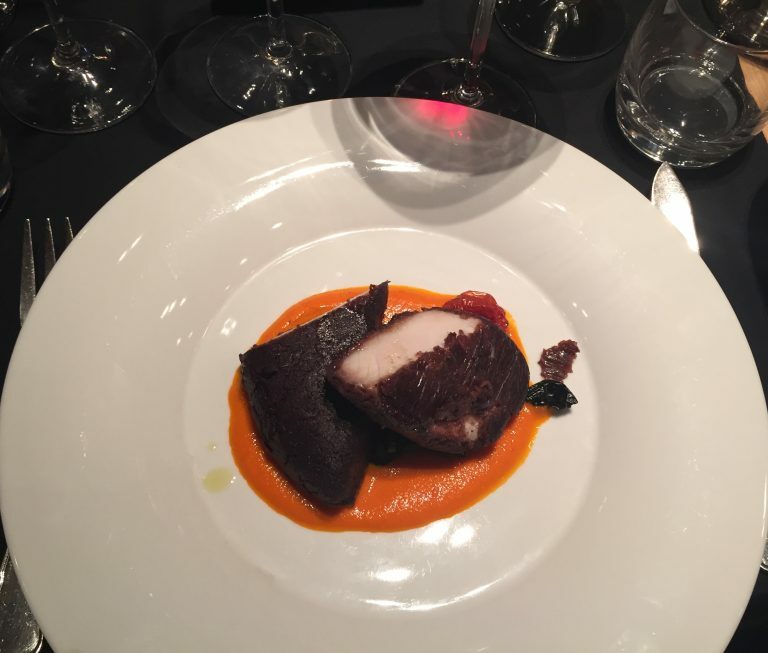 Amber jack fish crusted with black olives over red pepper sauce was a terrific match with the Contadoro. Except where noted, all are available at $9.99 from select retailers in the US. 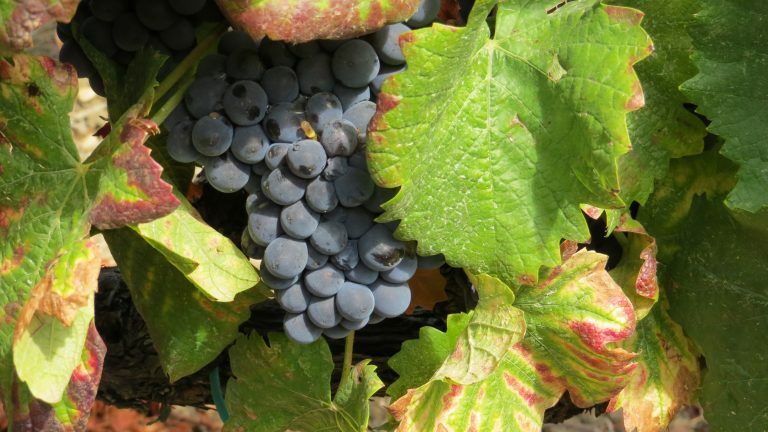 Pinot Grigio 2015: The grapes are harvested at the onset of ripeness at night to preserve their fragrance and acidity, with careful pressing to avoid too much color saturation. It sees 5 months on the lees, which gives it a unique bit of oomph without allowing it to get too fruity. 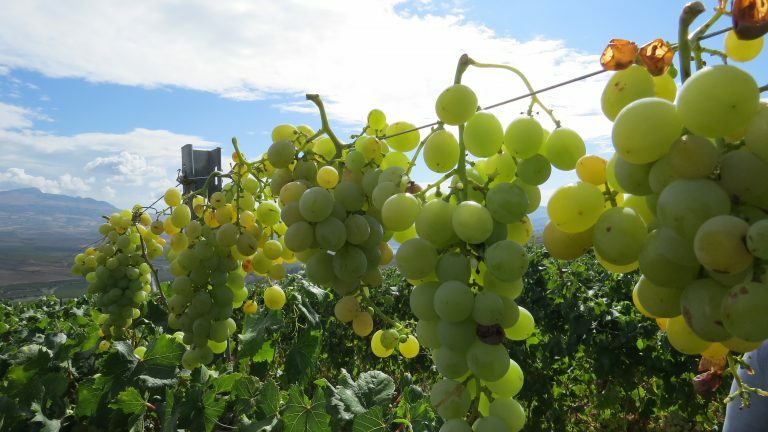 Grillo 2015: The fruit enjoys a long ripening season. This one also gets 5 months of lees contact in steel tanks. There is an excellent balance and structure to this wine, which would be a good one to serve to red wine fans who say they don’t like reds just to see if they can finally find one they like. Rosé 2015: Made from cold extracted, lightly pressed nero d’avola grapes, it’s bright, tart and a real crowd pleaser that matches a variety of foods from vegetables, hard cheeses and seafood to barbecue. Nero d’Avola 2013: Matricardi keeps this one real, with a period of malolactic fermentation and light maturation in French oak. Dark, ripe fruit with a hint of acidity and soft earth tones make it a natural match with olives and caponata as well as variety of tomato sauce-based pastas and cured meats. Lucio with a bottle of Contadoro at La Lampera. Pinot Noir 2014: Forget everything you perceive about pinot noir and just try this. Don’t compare it to anything. When you’ve allowed your brain to relax, take in its velvety fruit and dark chocolate notes. Just pretend it’s a wine from an indigenous Sicilian grape and you’ll be alright. Feudo Arancio Hekate Passito: The wine is made from a blend of aromatic grapes, including moscato, which dry in the sun on wires. It’s a dessert wine that retains bright acidity that keeps it from being too syrupy. 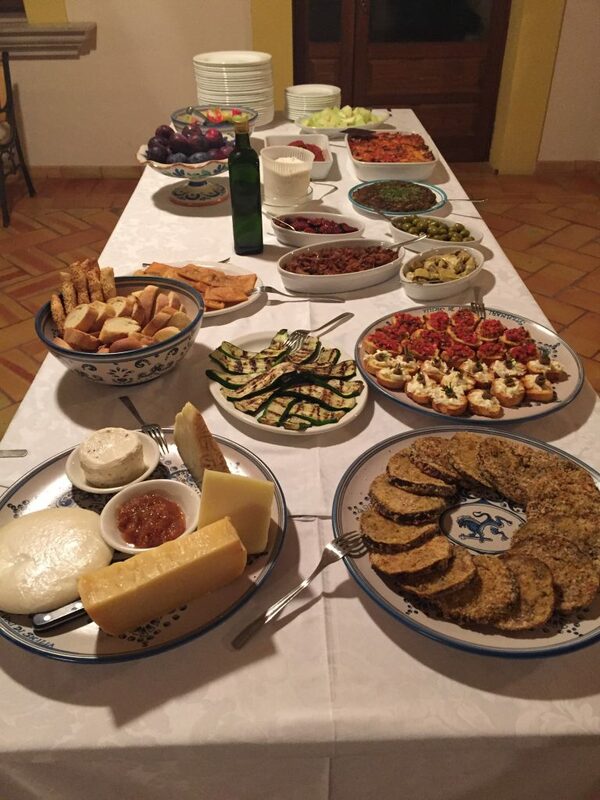 We liked it paired with fresh fruit, cheeses and cannoli. Though this is not currently sold in the US, it's work seeking out when abroad. Breakfast: It's What's For Beer!